Friends! Between now and the next three weeks leading up to Christmas, I’ll be giving you some Christmas gift ideas for your friends and family. Hey, if YOU are interested, drop some serious hints…These ideas are all lovely and are guaranteed to bless the recipient. I told Angela I’d have bought Granted on the spot solely from the cover! (Yes, I’m guilty of judging a book by its’ cover.) 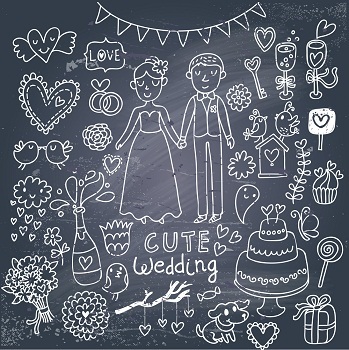 Note the wedding dress….Yes, love is in the air. 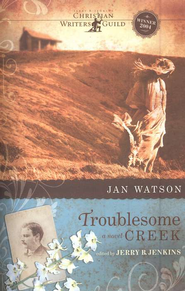 Critics have compared Angela’s writing to Jan Karon’s. I love her writing because her story is set in Kentucky with visits to my hometown of Lexington, including some of my favorite restaurants. Faith, food, fellowship, and farming play a large role in the story as well. Additionally, you’ll adore Granted’s characters. Annie, Jake, and Beulah are my favorites, but you’ll have to decide who yours are as there are plenty more to choose from. They jump off the pages to meet you and you find yourself lured into their story. Their simple lifestyle is terribly appealing, inspiring downtime and not activities to decorate your calendar. Angela says she hopes her readers’ takeaway is “inspiration to enrich intergenerational community whether it’s a neighborhood in Manhattan or a rural area in Alabama.”. Christian fiction can sometimes be sappy, as in way unrealistic, but I give my hats’ off to Angela as she does not tie every situation up into a tidy little knot. She keeps you guessing, throwing a few curve balls along with some characters who’ll make you want to teach them a lesson or two! Not only is there a wedding in store for the reader, a trip to Italy in the Tuscany region is also included with scenery Angela so beautifully paints. 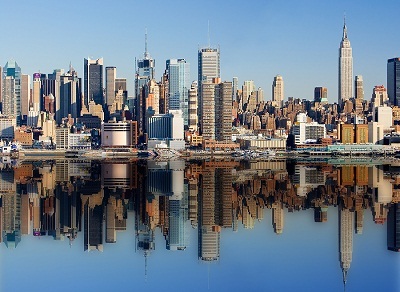 I’m ready to hop a plane there as I write. Actually, I’m dreaming of hopping a plane there! Grounded is the first one, with Guarded being the second. As a matter of fact, the entire trilogy would make an even greater gift! Life as Angela and her husband, Jess, experience fills Granted’s pages…If you live in Kentucky, I’ve got the perfect road trip for you either for the day, or for an overnight. 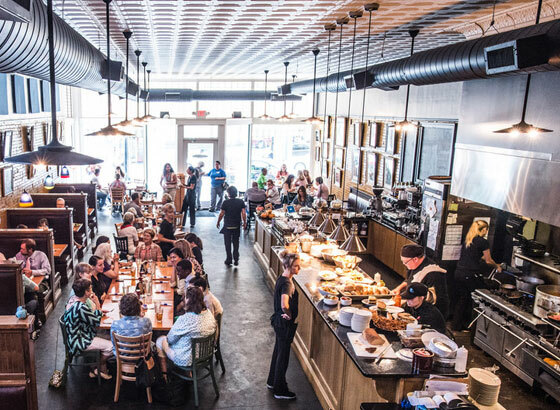 Drive to Stanford and grab a bite at the Bluebird Café. (www.bluebirdnatural.com) The café only serves food from local vendors and farmers, farm-to-table style. 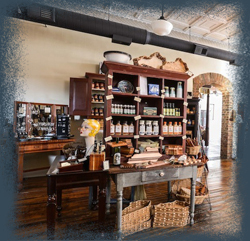 Following your meal, you can walk across the street to mill around Angela’s shop, Kentucky Soaps and Such (www.kentuckysoapsandsuch.com ). Warning: In addition to a wide variety of gifts including her goat’s milk cream (“Summer rain” is my favorite scent, but you may choose your own. ), there’s a bookstore within the store loaded with excellent selections. Last time I was there with friends, we needed multiple shopping bags. One of many favorite parts of her novel includes “porch time”—just sitting on the porch either reading or chatting with neighbors. John and I stayed in one of the Wilderness Road homes for a little respite not too long ago. We have pictures of us drinking coffee, sitting on a porch swing, taking in the morning. Go grab Granted, a cup of coffee or tea and enjoy the Christmas season. Grab one for a friend as a Christmas gift. You’ll both be blessed! P.S. I promised to share what’s ahead for Angela. She’s got a couple of projects in the works and when asked if this is the last time we’ll hear from the families on May Hollow Road she said, “There was a story arc I wanted to see through from the beginning and Granted does complete that. There’s room in the future to pick up other story lines from some of the characters, so it may not be the last time we hear from some of the characters, but Granted does round out the story of Annie’s return home.” Stay tuned! Friends! Greetings this lovely Lenten Season! All great ideas, thanks Nancy! I have another stellar idea for you that our Tuesday Bible study group, a/k/a “Blessings on Burlington” is about to embark on to help us appreciate Easter more. We’ll be reading Liz Curtis Higgs’ newest book, The Women of Easter—Encounter the Savior with Mary of Bethany, Mary of Nazareth, and Mary Magdalene. Before I even opened the book, I need to own up to the fact I wasn’t certain who all these Marys were. Once I dove in, I realized “Mary of Bethany” is none other than the chill-child-Mary vs. the nervous-Nellie-Martha…you know, that Mary and Martha duo. How many times have we all said, “Martha, Martha, you are worried and upset about many things…” (Luke 10:41) Liz calls Martha the “first century Martha Stewart”. She kills me. Mary of Nazareth was Jesus’ Mother and Mary Magdalene was the demon-possessed woman who Jesus healed and who became a devout follower of our Lord. The numerous details Liz reveals within each chapter on these Marys is fascinating. Liz walks us thru’ several parts of the Bible, teaching us along the way via various translations, making us feel as if we’re right in every scene. When Jesus raises Lazarus from the grave, you experience not only His affection for Lazarus, but the palpable grief from the sisters, Mary and Martha. Good luck getting thru’ Chapter Seven without hunting down a Kleenex or two, or ten. 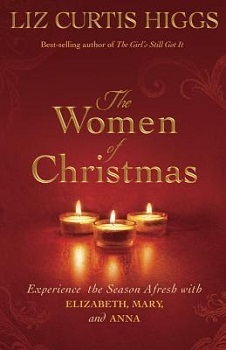 Liz’ description of what Jesus endured as well as the women looking on will take your breath away. May we STOP… and consider what we’ve learned this past year as we refocus on the cross and the miraculous resurrection this Easter. Liz’ book is akin to a guided tour toward the cross…and yet, praises we sing, with an empowering ending. Let’s celebrate! Sluggin’ down a can of spinach a la Popeye is not my idea of adding more iron to my diet. 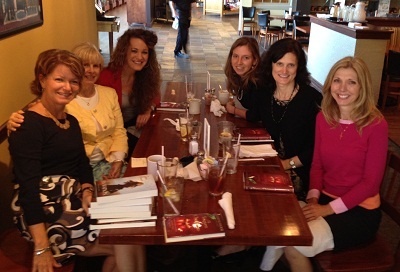 My dear friend Jane and I recently had the most delicious lunch at our favorite haunt, Jack Fry’s. Because this was post-holidays and we’d had more than our fair share of Christmas delicacies, we shared the warm brie salad, the infamous Jack’s burger, and fries (one cannot do without their fries). 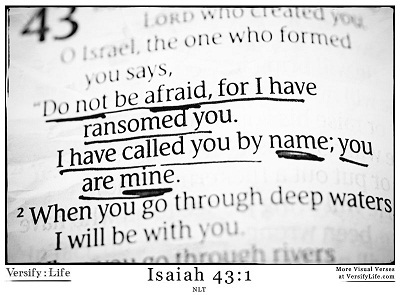 This week we’ll hear from more friends who’ve chosen one word for 2016 (see last week’s post) as well as learn about a nifty little verse you can see come alive. The verse? The week before Christmas, my buddy Nancy Sleeth from Lexington emailed several of us in Louisville and said, ”Hey, I’m going to be in Louisville 12/22, any possibility y’all can grab some lunch?” Don’t you know four of the five of us were free? What are the chances? Sleeth said, “Since Christmas is fast upon us, and we’re about to celebrate the birth of Christ, let’s all be thinking about sharing a birth and a re-birth story.” Hmmm…sure makes you think! 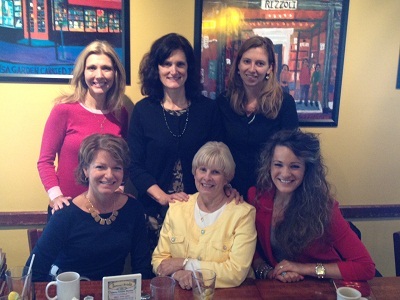 While we had quite the meal at Bonefish, each of us shared story after story. Sleeth’s conversation starter really blessed us all and awakened us to the “reason for the season”. This was a picture of Proverbs 27:17. This new year finds me devouring a book by Kay Wills Wyma called Cleaning House: A Mom’s Twelve-Month Experiment to Rid Her Home of Youth Entitlement . You can bet I’ll be sharing more from it later this year. I can’t wait to share one concept Kay offers which immediately kicked my brain into overdrive. It’s beyond brilliant. She says, “Like a steaming hot iron, these mothers and grandmothers will help us smooth out the wrinkles. They will be the iron upon which we can sharpen ourselves.” Oh, I want an Ironing Board, don’t you? As promised, I’d like to share a few more words in the spirit of “One Word for 2016” from a few friends who constantly sharpen each other. It’s my prayer these will help you choose your word. Diane’s word from last year was “intentional”, so she’s building on that and chose “prayerful” for 2016. Mary chose “Scripture” because she’s reading thru’ the entire Bible this year. Cousin Bonnie chose “Better”. I love ALL of these. Keep sharpening one another! Start your own Ironing Board! Share with us your word! Why Can’t Anyone See I’m Still Mourning??? 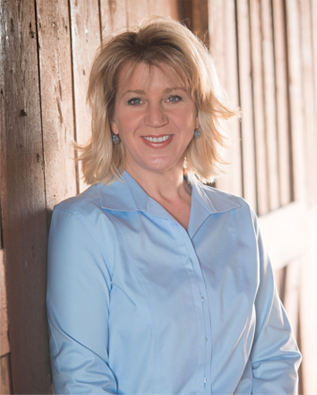 GUEST AUTHOR Angela Correll Teaches About Grace While Mourning… PLUS FREE BOOK GIVEAWAY! We (The Butter Babes) took it upon ourselves to take a road trip over to Stanford, become acquainted with Angela, and check out the farm-to-table restaurant she’s co-owner of, The Bluebird Café. (www.bluebirdnatural.com ) Angela met us for a scrumptious lunch, even graciously treating us(!!!). During lunch she and Fay realized they were at Georgetown College together, just a few years ago. Can the world be any smaller? 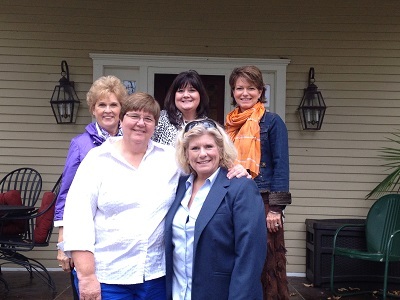 After lunch, Angela took us across the street to her darling store, Kentucky Soaps and Such. We did some feverish shopping, including snagging some of her wonderful goat’s milk soaps and lotions and made-in-Kentucky gifts. (www.kentuckysoapsandsuch.com) Sidebar: After running out of what I’d bought, I ordered more products for myself and have given countless others away for gifts. These have been a huge hit among my friends. My favorite is the body cream with the “summer rain” scent. 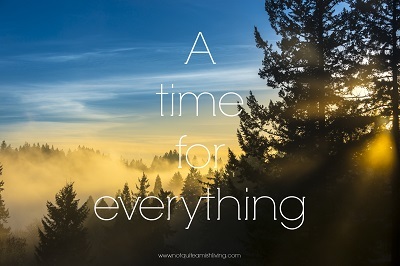 –NOW…..PLEASE SIT BACK AND ENJOY ENCOURAGING, RELATABLE WORDS FROM GUEST AUTHOR AND FRIEND, ANGELA CORRELL…..
A season of mourning used to be practiced in our country as a time set aside for people to show the signs of grief outwardly. Most of us are only able to picture that kind of grieving because we’ve seen a movie like “Gone with the Wind,” where proper society demanded the bereaved wear black for a year and turn down social engagements. But well into the last century, a time of mourning was still common practice, with department stores having entire sections devoted to mourning clothes. A bereaved person was given the time and space to properly mourn and heal the loss of a loved one. Everyone who came in contact with a person in mourning understood that something quite devastating had happened. They were given a little extra understanding, more time to be out of a normal routine, and more patience in everyday expectations. 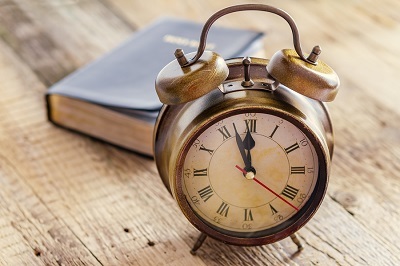 The time periods allotted could be anywhere from a six months to a year. We lost our son-in-law two years ago in April. We loved him as a person, but he was also husband to our daughter and father to our dear grandchildren, only three and five years old. It was unexpected and it was shocking. For about two weeks, we were able to grieve and stop our normal routine, but work demands gradually pulled us back in, and we made the attempt to continue life as we had before since it seemed that was what was expected of us. Just as when a person heals from surgery, the whole of their physical strength is working to heal the injured place. This means they’re left with very little energy to do anything else. It’s the very same with an emotional injury like grief. By the end of that first summer, the smallest of tasks exhausted us. I realized we made a mistake by trying to get back to normal far too soon. Yet it seemed everyone around us expected life to go on as before, although it would never be quite the same for us again. I longed for the culture of mourning so I could wear a reminder to others that things weren’t quite right yet and to please give us a little extra grace. Truthfully, I have done the same to others by carrying on with unrealistic expectations. And it’s unlikely our society will go back to the mourning period anytime soon. But, it did make me think about others who have suffered losses. Since they aren’t wearing black, I don’t always know, but maybe it’s the store clerk who was a little short with me when I asked a question; maybe it’s the church member who didn’t smile and greet me; or maybe it’s someone I do know is grieving. Whatever the case, I hope I can give out an extra measure of grace, just in case. What wonderful words to live by! It’s a shame we grievers don’t still wear black beyond the funeral! May we all be in tune to those around us who are grieving while extending more grace. Blessings to you, Angela, and we hope to make another road trip your way real soon! Seems we are all on the same page over mourning this week… Please read more words of encouragement from Kurt Sauter. 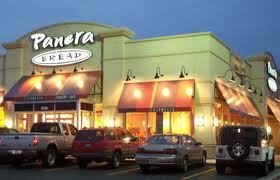 We’d just had a delicious breakfast outside at Panera. Yes, to the horror of most veterinarians, Gracie managed to con us out of a few scraps. 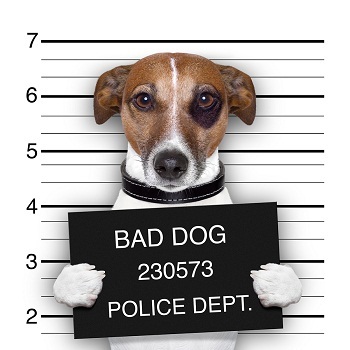 Smart girl, she knows when to play her terrier card. 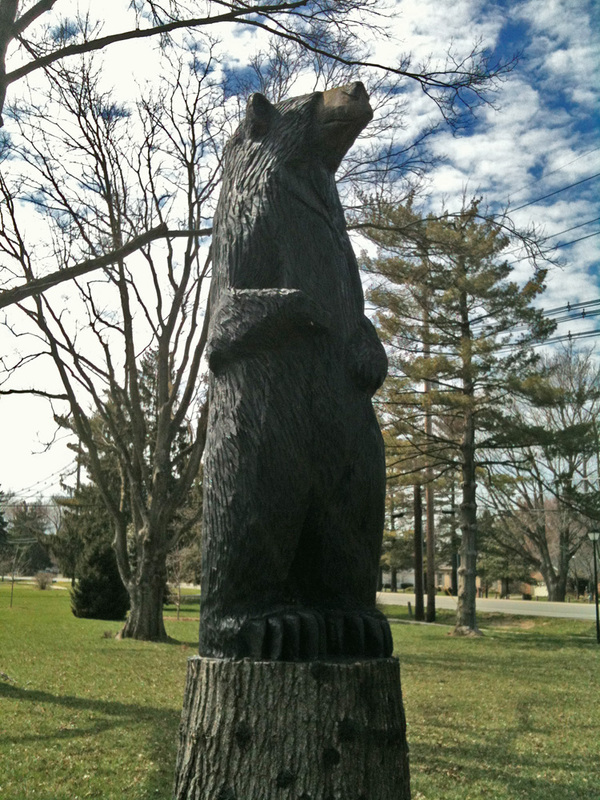 Several years ago, the City of Windy Hills commissioned a chain saw artist to carve a very tall bear out of a very tall tree stump—as in twenty-five feet tall. This bear, better known as “my bear” (wonder who else calls him that?!!) has been standing guard over a lovely park at this very same intersection. Some clever soul adorns “my bear” each Christmas Season with a very svelte red bow. 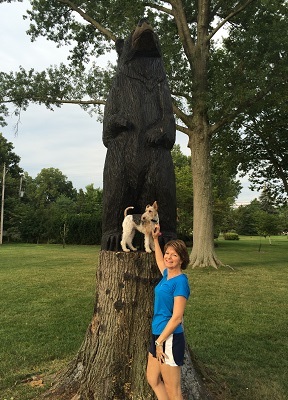 While he’s been affectionately known as “my bear” for years, and we drive past him numerous times daily, we’ve never stopped long enough to become acquainted….until today. This park offers loads of benches where one can sit and read, or picnic, or simply rest and soak in the environment. Even tho’ it’s on a busy street, there’s a meandering path of mulch to walk on and you’ll find yourself quite a distance from the traffic. Onward we proceeded down the sidewalks of Rudy Lane. We walked down two streets we’d never been on before. This area is very close to where our first home is located. Why, you ask, hadn’t we explored here before? Sad answer is that four-letter word we try to gain more of: TIME. Our eyes were opened to several new discoveries once we slowed down…..We happened to stop for a minute to look across the street at some large front yards on Rudy Lane. 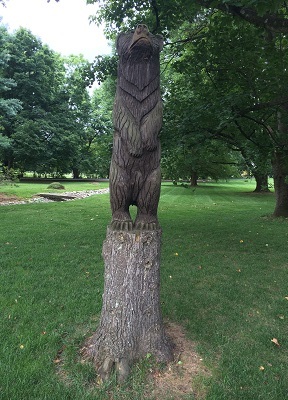 To our complete astonishment, there before our very eyes, was another carved bear!!! Are you kidding me??? He can be found right around the corner from “my bear” in the park. He is equally adorable and sports a pinwheel to bedazzle onlookers on a windy day. I remain clueless as to how long that bear has been there. 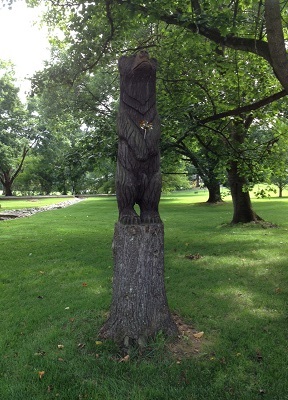 And just wait for this: we found one more carved animal from a tree stump, not even a mile from these bears. 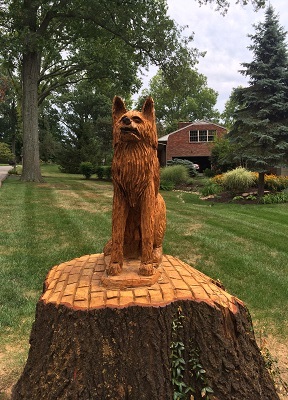 It’s either a coyote or a wolf…and he lives off of Hubbards Lane on Pin Oak Lane. John and I are blessed to have become acquainted with an amazing couple in Lexington. They’re the type the more you’re with them, the more you want to be with them. You know the type? I s’pose one reason we’re so fascinated by them is we desire to emulate they’re lifestyle. Their names? 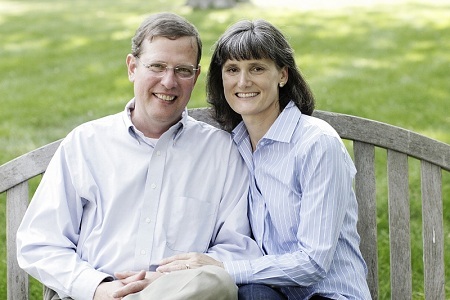 Matthew and Nancy Sleeth. They’re the co-founders of an amazing educational non-profit called Blessed Earth. 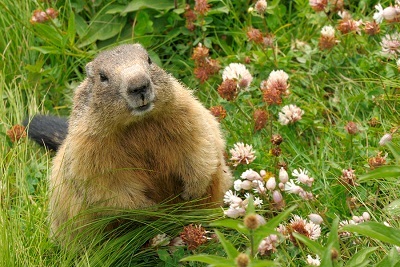 (www.blessedearth.org) Creation care, as in becoming better stewards of the earth, is their mantra. They also happen to each have written phenomenal books that are perpetual resources. 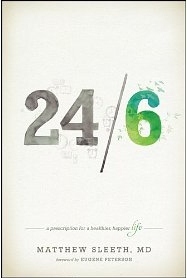 Matthew wrote 24/6: A Prescription for a Healthier, Happier Life . 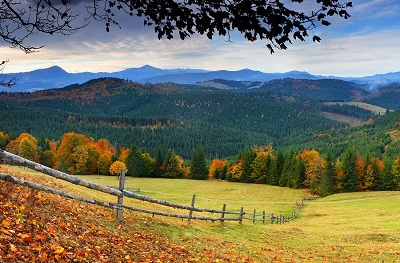 The busyness of modern life has a way of thwarting even the best of intentions…Yet each time we seek out an Almost Amish path, we move one step nearer to the Kingdom of God. Nancy and Matthew are proficient at slowing down. They faithfully honor God’s weekly gift to us: the Sabbath. Matthew says they find themselves “wealthy with time” when they observe the Sabbath. When was the last time you found yourself “wealthy with time”??? Let’s close with a poem which later became a hymn by William D. Longstaff. He hailed from England and used his wealth to bless many others, including Dwight Moody and Ira Sankey. Abide in Him always, and feed on His Word. Forgetting in nothing His blessing to seek. Spend much time in secret with Jesus alone. And run not before Him whatever betide. In joy or in sorrow still follow thy Lord. And, looking to Jesus, still trust in His Word. Each thought and each motive beneath His control. If you’re more of a visual than a text person, please stay seated for just three more minutes and watch Jamie Grace’s song, It’s a Beautiful Day. Her photographs are exactly what I’ve been trying to articulate about keeping our eyes open. Let’s “get our worship on”!!! Praise and Glory be to God. Could there be anything better than being in a fantastic bookstore (Joseph Beth Booksellers in Lexington, Kentucky), while eating in their café, with amazing authors? Few things thrill me more than soaking in conversation with fellow wordsmiths. With these gals, we never lacked for a thing to talk about. But the best thing about this group is they ALL love the Lord and talk about what God is doing in their lives, their ministries, or a book or Bible study that’s helped them in their walk of faith. I simply sat and soaked it all in. 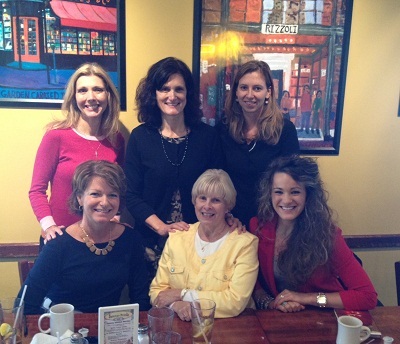 Allow me to share some insight into these fascinating gals: On the right in the front is my good friend, Dr. Pam Stein. Pam and I’d just dashed over from Lexington Christian Academy (LCA) where her son, John, had spoken powerfully on prayer. 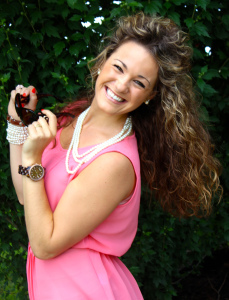 (click on…”Seventeen year old preaches w/power” to hear more…). Next to Nancy, at the end of the row on the right, is sweet Laura Leavell. Laura’s Mom, Sherry, is one of my dear friends and I’ve been blessed to meet the Sleeths thanks to Laura, because she works for Blessed Earth. Laura is a ten-talent gal. Besides helping the Sleeths, she juggles many more brilliant balls in the air. She’s wise beyond her years. Next to Kelsey, in the middle of our row is my friend and mentor/guardian angel, Jan Watson. I can’t say enough about Jan. Funny she’s wearing butter yellow, because it’s highly appropo’ to tell you that the year I met her, Nancy Aguiar and I had ventured over to Lexington to the Book Fair Joseph Beth was hosting. We were also scheduled to have lunch with Paula Deen. 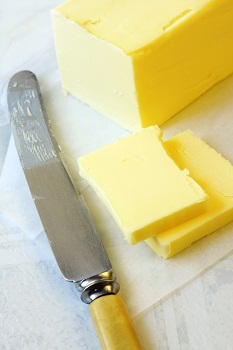 Yes, the Butter Queen. Well, Nancy and I ate with Paula and sixteen hundred others. Small detail. Jan’s writing career is highly unique. A nurse for thirty-plus years, devoted Mom to three boys, and dedicated wife to her dear husband (who’s now in Heaven), Jan had had a story in her heart and mind for years. Her husband encouraged her to enter a writing contest. Never mind that it was Jerry Jenkins’ Christian Writer’s Guild Writing Contest. Never mind that SHE WON, which translated into a book contract with Tyndale Publishers! Never mind she recently released her seventh novel! Every single time I read her novels, I say, “Okay, this one is your best!” And then I read the next one and say the exact same thing. Jan is hysterical funny in a dry wit kind of way. Her characters readily come off the pages to greet you, some of which you love, and some you’re ready to call the authorities on. An animal lover, Jan sprinkles critters throughout her novels for your entertainment and attachment. 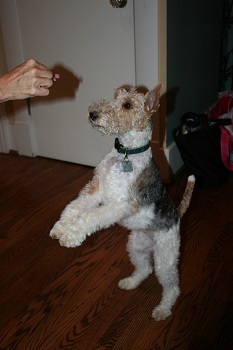 Her real-live dog at home, Maggie, is a “terrific terrier” like our Gracie is. That phrase could be an oxymoron. I suspect Maggie’s influenced more than a few of these novels. I love how Jan uses Scripture and prayer to help her characters cope. 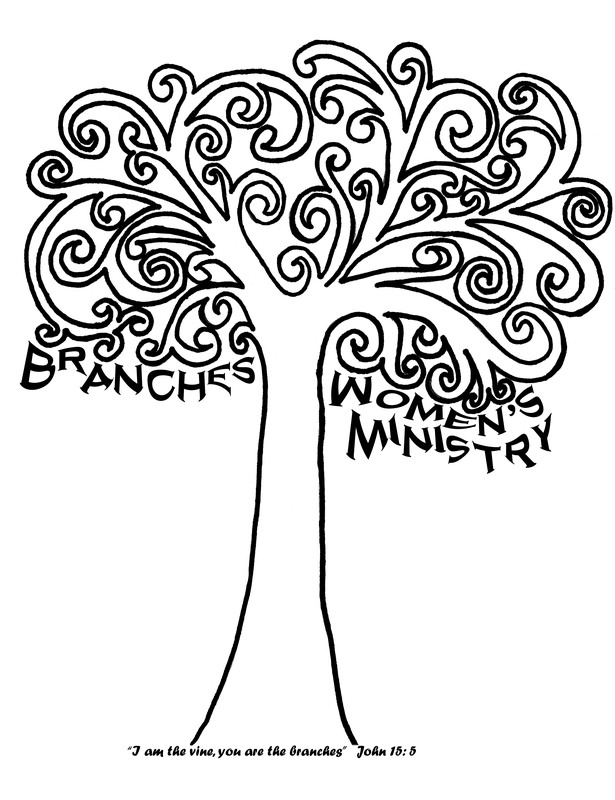 In Tattler’s Branch, Sunday school lessons and Scripture memory play a big role. 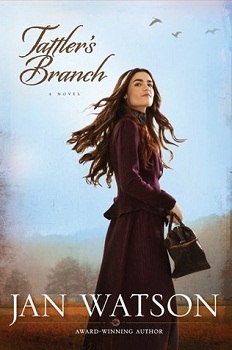 Her main character, Doc Lilly, reveals her love for and need of God’s Word, a great lesson for every reader. One favorite part comes in a letter written to her Mother where Lilly says, “Just as I’ve watched you do in moments of travail, I cling to Scripture for solace.” Another is “The Word. His Word, brought the Lord so near, it frightened her, but at the same time delighted her.” Love that! Page-turning suspense, including a murder, set in the hills of Kentucky, are just about all this Kentucky girl needs for a lovely afternoon of reading. Jan’s medical background makes her book all the more real and full of intrigue as well. One more element Jan includes, which totally convicted me of God’s love for everyone, even those as slimy as this atrocious man named Shade, is when Doc Lilly offers the Gospel to him. One of many beautiful elements in this conversation includes, “The ground at the foot of the cross is even.” Why do we forget that? What transpires because of Lilly’s Godly love for Shade, regardless of his treatment of her, is unbelievable. It’s an only-God-could-pull-this-off moment. And the stunner-of-an-ending? Well, you’ll have to read it to find out! Bravo, Jan! Another out-of-the-ball-park book! If you want to read more about Jan check out this article! 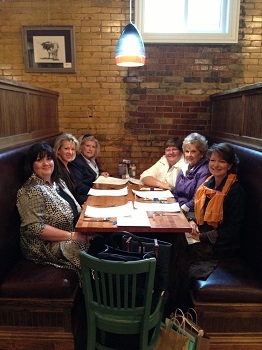 Thanks to ALL you girls: Pam, Nancy, Laura, Kelsey and Jan for a fun time of fellowship and lunch. Only grave error on our part was we didn’t partake of some sinful chocolate dessert. Next time! TWO Upcoming Events: Book Signing 10/17 and Book Club Meeting 10/28 are WORTHY of your Calendar!!! Greetings and Blessings to you this Fall Season! Before we get too far into October, I wanted to be sure and let those of you who live in or near Louisville, Kentucky know about two exciting events! 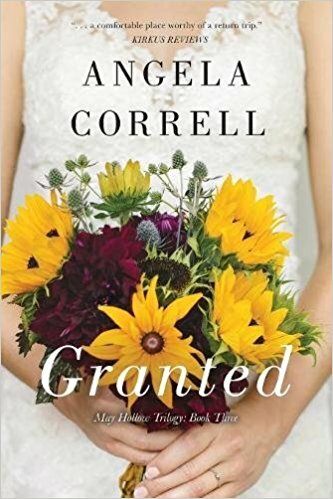 There’s a brand-new, debut novel out by Angela Correll. Angela hails from Stanford, Kentucky, has been writing for local newspapers for years, and has now ventured out into the book world! Her book, Grounded, is quite the page-turner. 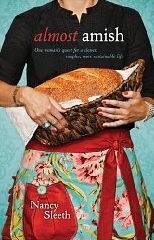 My friend Nancy Sleeth, who wrote Almost Amish sent me Angela’s book recently. 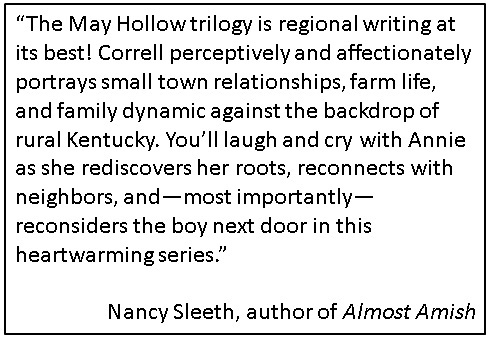 I was dumbfounded to discover Nancy has endorsed Angela’s book on the front of the cover, while my other writing buddy in Lexington, Jan Watson (author of her newest novel Tattler’s Branch) has endorsed it on the back!!! Two perfect reasons to read Angela’s book above and beyond its’ intrigue!!! All that to say, I’m beyond excited to meet Angela. And I can’t say enough good things about her novel. You will love it. Her characters jump off the pages and I found myself totally tickled at the main character, Annie Taylor. Annie’s feverish attempts to adapt to a small town in Kentucky while trying to reconcile her relationship with her Grandmother are mesmerizing. Will they reconcile? Is it possible? 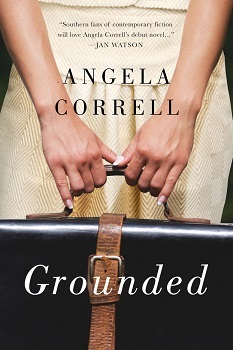 Ahhh, well you‘ll have to read Grounded and find out! I’m happy to report the novel is not without romance nor suspense, either! These little threads build into a beautiful tapestry, complete with surprises I couldn’t have predicted. 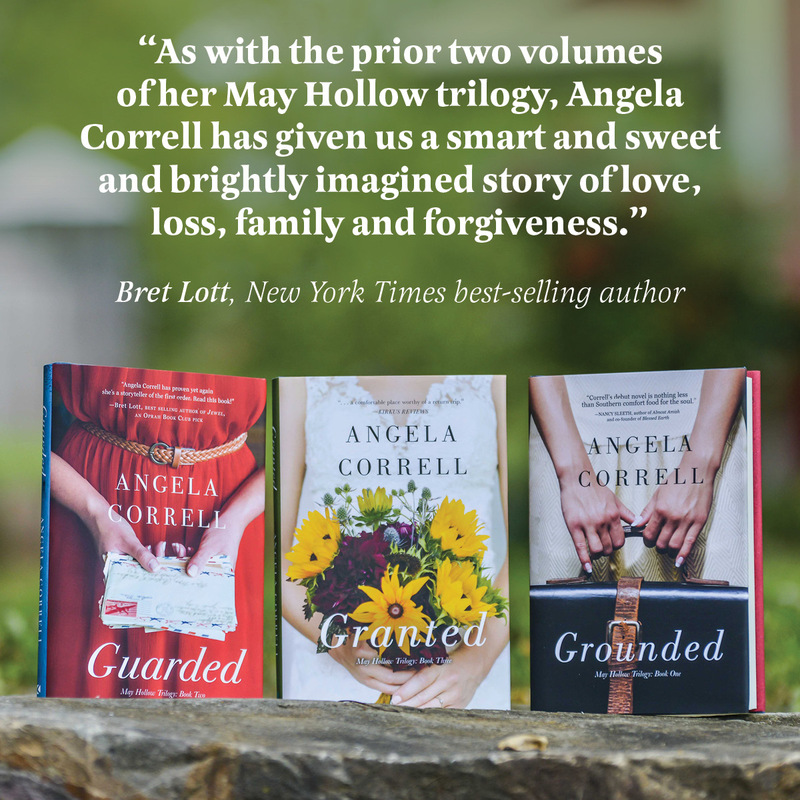 Run, don’t walk to your nearest bookstore to grab Grounded. You’ll love it. 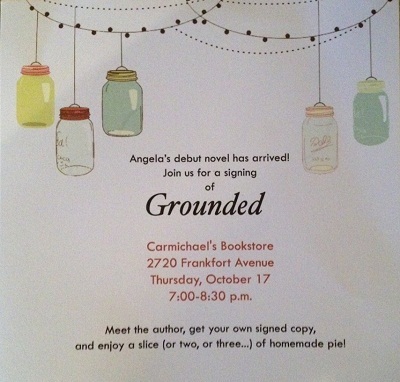 And don’t forget to come meet Angela at Carmichael’s on October 17th! 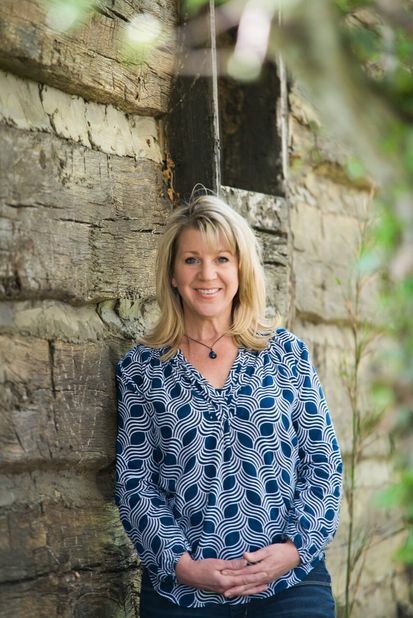 Calling all Karen Kingsbury fans!!! 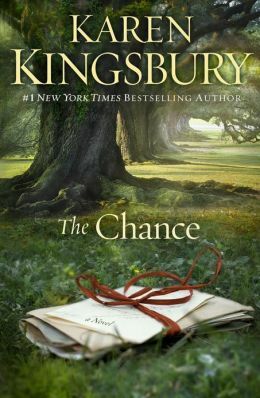 Yes, indeed, we’ll be discussing Karen’s newest novel, The Chance.